Roy Haynes: [Charles] Mingus used to say the damndest thing about me years ago. He’d say, “Well, Roy Haynes. Yeah. You don’t always play the beat. You suggest the beat. I don’t know what the heck I was doing, but I know that the beat is supposed to be there. If I leave out a beat — it’s still there. If I’m playing fours or eights or twelves, and I play four-and-a-half bar and leave out a bar-and-a-half — that don’t mean I don’t want it to sound like that! But, if I’m playing with a horn player — sometimes they get confused. They get hung up ’cause I didn’t play a bar-and-a-half. You got to use a little imagination in there. That bar-and-a-half still counts. I’ll come out in the right place — where it should be — to make it even. And they’re somewhere else at that point. I didn’t always play the beat which I though was very good. You don’t always have to say ding ding-da ding ding-da ding. You know? It’s there. So if one of those saxophone players has to depend on that, then you know he’s not right or something. You’ve got to have ding da da ding within yourself. [John] Coltrane had it. [Lester Young] Pres had it. Miles [Davis] had it. So it’s beautiful with them. But there’s so many other people who don’t have that thing — and you got to carry them. Now how you gonna be inventive and create when you’re trying to lift them up? 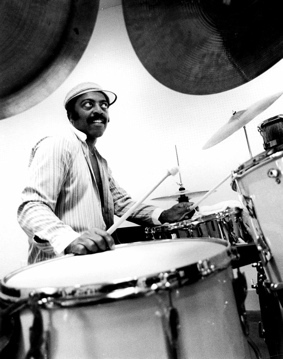 SKF NOTE: The morning of September 9, 2015 I found more pages from my Roy Haynes interview with more details about Roy’s Vistalite drums. Several registered users of the Drummerworld web forum commented on Roy’s Vistalite’s, surprised to know Roy played them, and hungry to know more specifics about Roy’s Vistalite drumset. The first time I saw Roy perform he was playing a five-piece Vistalite outfit. A year later his set had grown! The two mounted toms had multiplied to six, one floor tom, and a single-headed bass drum. The set was augmented by temple blocks, Vistalite bongo drums, ratchets, a tambourine, and probably several percussion things Roy didn’t happen to use that night. “It’s interesting.” Roy spoke about his set. “With the set I have now, the see-through drums — people love ’em! And somebody will come into a club and they’ll get wrapped up with the drums right away. Even before you play you got it made,” he smiled. “I read a review about myself in some paper and the reviewer wrote, ‘Roy Haynes’ drums look better than they sound.’ That’s the worst thing I’ve ever seen about myself,” he laughed. SKF NOTE: September 20, 2015. I found this Roy Haynes Ludwig Vistalite ad in the May 20, 1976 Down Beat. This entry was posted in SKF Blog and tagged Drummer, Ludwig, Modern Drummer, Roy Haynes, Scott K Fish. Bookmark the permalink.